Pioneering realty website Homes.com is revealing a new, modernised brand experience and supporting marketing campaign in partnership with Norfolk-based digital agency Grow. In order to meet the needs of today’s digitally-native homebuyers, while differentiating it from competitor brands like Zillow, Trulia and Realtor.com, Grow set out to reimagine the brand through a streamlined and intuitive people-first experience. Millennials represent the largest share of homebuyers today, so Homes.com and Grow created an experience that’s simply and beautifully designed, personalised and reflective of what’s most important to this category of buyers. Insights stemming from consumer and industry research informed Grow’s approach to create a digital experience that better mirrors the human experience of buying a home. Using those insights, Grow created three new key features called Homes.com Snap & Search BETA , Homes.com Match and Homes.com HomeShare, which were created with powerful AI technology — such as machine learning and predictive search — as well as careful consideration to simple user experience. These features will turn Homes.com into the premier home search destination. These proprietary features have also never been implemented in online homebuyer searches. Homes.com Snap & Search BETA is an entirely new feature for both Homes.com and the real estate sector, allowing image-based search of millions of properties through AI. Just as the name suggests, users can either snap a photo of a home with their phone’s camera or grab a photo they’ve saved from other sites like Pinterest or Houzz, and upload it to Homes.com to search for homes with similar exterior styles in their desired location. Future versions will allow users to search with interior photos. Homes.com Match is a more human way to search for a home. In the search criteria, house hunters can prioritize what they “must have” and note what’s “nice to have,” the way homebuyers naturally do when they talk to their agent about what they’re looking for. Match then assigns a match percentage to that home based on how well it fits their preferences. This way, homes aren’t automatically ruled out when they don’t have “nice to have” features. Homes.com HomeShare simplifies the collaborative aspect of searching for homes. When searching together with family, friends and agents, HomeShare lets collaborators save, share, comment, and track their favorite listings within Homes.com. 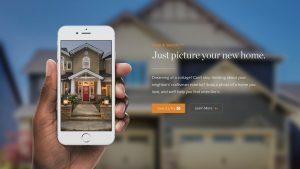 Grow also created and developed a national, digital ad campaign to introduce the new Homes.com, which will showcase what a ‘Simply Smarter Home Search’ really looks like for homebuyers. The campaign leads with the key features that differentiate the Homes.com experience from the rest of the category: Homes.com Snap & Search, Homes.com Match and Homes.com HomeShare.